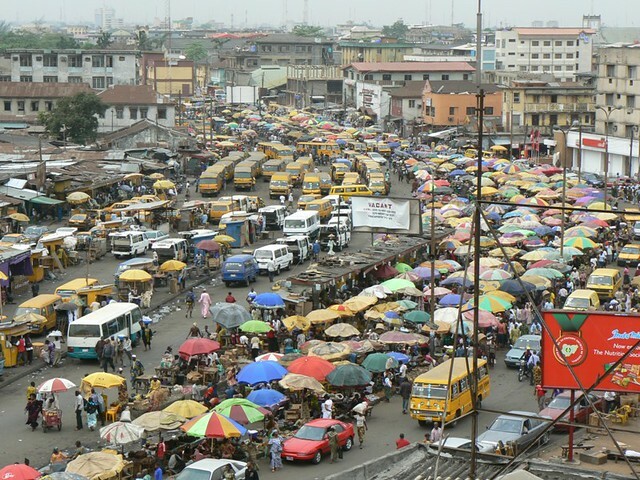 Oyingbo Market in Lagos. Photo Credit: The New Gong Magazine. Commencing my regular commute from Sabo Yaba to Festac, I boarded a keke- marwa, the ubiquitous tricycles used for commercial transportation throughout Lagos, to Office Oyingbo. The keke-marwa dropped me off in front of Tantalizer, a fast food chain popular for serving everything from western hamburgers to Nigerian staples like moi moi. The next leg of my commute was a danfo bus. To catch my bus, I needed to cross the 4 lane highway- with 3 lanes of mixed traffic and one dedicated lane for the BRT. Like any sane person trying to cross a major road in Lagos would do, I found someone else who was crossing to be a barrier between me and oncoming traffic. Safely across the road, I walked toward my bus. Oyingbo market is a bustling market with women selling everything from stockfish to shea butter to clothing. It doubles as a boisterous bus station. A fairly large station, Oyigbo has buses that travel as far as Ibadan, Nigeria’s third largest city more than 75 miles from Lagos, and as near as Close Sabo-Bariga gate, just a quick 20 minute trip. My bus to Orile-Okoko doesnt have the same layout as the popular four row danfo buses. Longer and wider, and with six rows, it can carry more passengers. Each row holds a long bench meant to seat 2 comfortably but almost always holds 3 passengers, an aisle that is usually filled with a jump seat when the bus is full and another single seat across the aisle. Usually, the single seat is the most reliably comfortable seat on the bus. Because danfo buses get crowded and uncomfortable fast, choosing a good seat requires careful strategy. The front row is right behind the engine and gets hot quickly, the last row makes exiting take longer, so the middle row is often the best bet. On that particular day, the middle row was filled; so I took my chances with the last row. An older Yoruba woman was on one side of the row and a younger Igbo woman was on the other. Without enough room for my legs to be comfortable when straightened I adjusted myself from side to side in an effort to achieve whatever comfort was possible without taking up too much space. Out of the corner of my eye, after I’d almost given up, I noticed a woman leaving one of the single seaters and I quickly scurried forward to take her seat. After a few minutes of waiting, the bus slowly began filling up. Eventually two men with longer legs took the back seat without any legroom. Feeling a bit of guilt for having left that seat given that I am much smaller than them, I reminded myself of my rule- that on danfo buses in Lagos, you have to seek your own comfort first. (My only exception is mothers carrying infants or small children). The last few people to board the bus were market traders who had come to Oyigbo to buy stock fish or produce to sell in their local market. For traders carrying heavy goods on the bus, there is often a bargaining process between themselves and the conductor, with the passenger trying to negotiate to pay a rate that is less than double the fare, even though their goods will occupy a full seat. Some market traders win the fight while others resign themselves to waiting for the next bus. In an attempt to make more money without giving up precious space, my danfo conductor climbed atop the roof of the bus and loaded the extra items there. With each new item, I watched the roof cave in ever so slightly, until, from my view inside the bus, the roof was fully convex. Loudly exclaiming in Yoruba, “Tori Olorun” (Translation: For the love of God). I began what had become a regular silent prayer for my safe commute. “Dear God, please don’t let this roof cave in before my bus stop, First Gate.” Throughout the ride, at every pothole or speed bump, I repeated my prayer.